Hepatitis C virus (HCV) infection in more than 170 million chronically infected patients with no developed preventive vaccine is a globally important issue. In addition to expected hepatic manifestations, a number of extrahepatic manifestations, such as mixed cryoglobulinemia, glomerulonephritis, polyarteritis nodosa, rashes, renal disease, neuropathy, and lymphoma, have been reported following HCV infection, which are believed to be influenced by the virus or the host immune response. HCV combination therapy with pegylated interferon and ribavirin might be associated with side effects as well. The association of HCV with special oral conditions has also been reported recurrently; the mechanism of most of which remains unclear. This article reviews the association of HCV infection with some of the oral conditions such as oral health, Sjogren's syndrome, lichen planus and oral cancer. Background/Aim: To assess the correlation between serum HBsAg titers and hepatitis B virus (HBV) DNA levels in patients with hepatitis B envelop antigen-negative (HBeAg −ve) HBV genotype-D (HBV/D) infection. Patients and Methods: A total of 106 treatment- naïve, HBeAg −ve HBV/D patients were included; 78 in the inactive carrier (IC) state and 28 in the active hepatitis (AH) stage. HBV DNA load and HBsAg titers were tested using TaqMan real-time polymerase chain reaction (PCR) and automated chemiluminescent microparticle immunoassay, respectively. Results: The median (range) log10 HBsAg titer was significantly lower in the IC group compared with AH group, 3.09 (−1 to -4.4) versus 3.68 (−0.77 to 5.09) IU/mL, respectively; P < 0.001. The suggested cutoff value of HBsAg titer to differentiate between the two groups was 3.79 log10 IU/mL. In addition, there was a significant positive correlation between HBsAg and HBV DNA levels in the whole cohort, AH, and IC groups (r = 0.6, P < 0.0001; r = 0.591, P = 0.001; and r = 0.243, P = 0.032, respectively). Conclusion: Serum HBsAg titers may correlate with HBV DNA in treatment-naïve HBeAg -ve HBV/D patients, and supports the use of HBsAg levels in clinical practice as a predictor of serum HBV DNA levels. 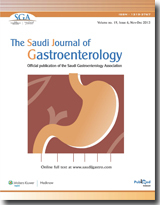 Background/Aim: Gastric cancer (GC) is considered to be a disease of elderly patients. It has been suggested that GC in young adults has more aggressive clinical and pathologic features than in adults. In this study we aimed to evaluate clinical and pathologic features of GC under age 40 years. Patients and Methods: Patients included in this study were those treated and followed up for GC under age 40 years in Ankara Numune Education and Research Hospital from 2002 to 2011. Results: Clinical and pathologic features of 82 patients have been evaluated retrospectively. 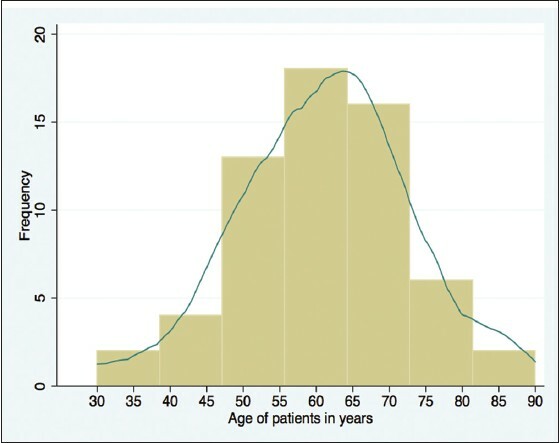 Of the patients 44 were male (54%) and 38 were (46%) female, and the median age was 35 years (min-max: 18-40 years). The tumor was grade 3 in 77% of the patients, 79% had diffuse type tumor, 64% had lymphovascular invasion, and 76% had perineural invasion. Forty-seven patients (57%) were metastatic at the time of diagnosis. The median follow up was 9 (1-101) months. The median overall survival (OS) was 9 months in metastatic patients and 8-year OS was 64% in nonmetastatic patients. Conclusions: We observed that young GC patients had more aggressive histopathologic features and more than half was metastatic at the time of diagnosis. We need more studies comparing young and elderly patients to confirm that young patients had more aggressive disease. Background/Aim: Adult studies established a relationship between hepatitis C virus (HCV) infection and the presence of non-organ-specific antibodies (NOSAs). Most studies were carried out on genotypes 1 and 2. Only a few studies addressed that issue in pediatrics. No studies have been carried out on autoimmunity and genotype 4 in children. We aim to investigate NOSAs in 80 Egyptian children with chronic HCV infection along with studying the underlying genotype of HCV, and correlating autoimmunity with the epidemiological, clinical, biochemical, and virological features. Materials and Methods: HCV-RNA was assayed by the polymerase chain reaction and viral genotypes were determined. NOSAs were measured and liver biopsies were taken for histopathological examination. Results:Genotype 4 was the only detected genotype in the included 80 patients. Anti-smooth muscle antibodies (ASMA) were the only detected antibodies in 32 (40%) patients, always with V specificity (vessels only) at titers ranging from 1:20 and 1:160. Anti-nuclear antibodies (ANA) and liver-kidney microsomal antibodies-1 (LKMA-1) were not detected in any of our patients. Epidemiologic and clinical features did not significantly differ between autoantibody-positive and -negative patients. 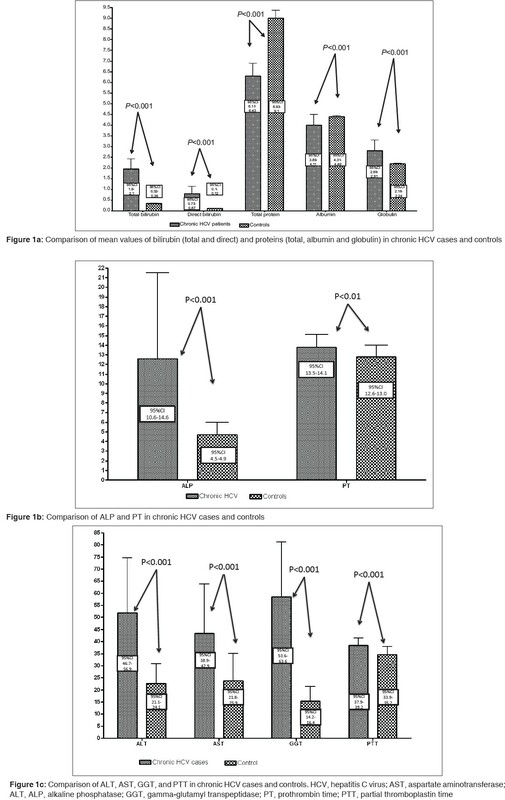 Among biochemical features, significantly high levels of total bilirubin, albumin, immunoglobulins, alkaline phosphatase, and gamma-glutamyl transpeptidase were found in the antibody-positive group. Conclusion: Genotype 4 HCV is the prevailing genotype in Egyptian children with chronic HCV infection. A consistent proportion of these children with chronic HCV infection circulate non-organ-specific autoantibodies. The prevalence of ASMA and the absence of ANA and LKMA-1 might be related to the unique situation in Egypt with unique prevalence of genotype 4. More studies are warranted on larger pediatric population to validate these findings. Background/Aim: Peritoneal carcinomatosis (PC) is a pernicious event associated with a dismal prognosis. Complete cytoreductive surgery (CCRS) combined with hyperthermic intraperitoneal chemotherapy (HIPEC) is able to yield an important survival benefit but at the price of a risky procedure inducing potentially severe complications. Postoperative peritonitis after abdominal surgery occurs mostly when the digestive lumen and the peritoneum communicate but in rare situation, no underlying digestive fistula can be found. The aim of this study was to report this situation after CCRS plus HIPEC, which has not been described yet and for which the treatment is not yet well defined. Patients and Methods: Between 1994 and 2012, 607 patients underwent CCRS plus HIPEC in our tertiary care center and were retrospectively analyzed. Results: Among 52 patients (9%) reoperated for postoperative peritonitis, no digestive fistula was found in seven (1%). All had a malignant peritoneal pseudomyxoma with an extensive disease (median Peritoneal Cancer Index: 27). The median interval between surgery and reoperation was 8 days [range: 3-25]. Postoperative mortality was 14%. Five different bacteriological species were identified in intraoperative samples, most frequently Escherichia coli (71%). The infection was monobacterial in 71%, with multidrug resistant germs in 78%. 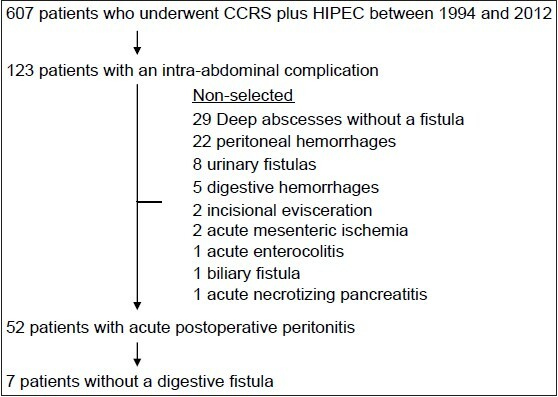 Conclusions: Postoperative peritonitis without underlying fistula after CCRS plus HIPEC is a rare entity probably related to bacterial translocation, which occurs in patients with extensive peritoneal disease requiring aggressive surgeries. The principles of treatment do not differ from that of other types of postoperative peritonitis. Background/Aims: Identifying patient-related factors as well as symptoms and signs that can predict pancreatic cancer at a resectable stage, which could be used in an attempt to identify patients at an early stage of pancreatic cancer that would be appropriate for surgical resection and those at an unresectable stage be sparred unnecessary surgery. Materials and Methods: A retrospective chart review was conducted at a major tertiary care, university hospital in Riyadh, Saudi Arabia. The study population included individuals who underwent a computed tomography and a pancreatic mass was reported as well as the endoscopic reporting database of endoscopic procedures where the indication was a pancreatic mass, between April 1996 and April 2012. Any patient with a histologically confirmed diagnosis of adenocarcinoma of the pancreas was included in the analysis. We included patients' demographic information (age, gender), height, weight, body mass index, historical data (smoking, comorbidities), symptoms (abdominal pain and its duration, anorexia and its duration, weight loss and its amount, and over what duration, vomiting, abdominal distention, itching and its duration, change in bowel movements, change in urine color), jaundice and its duration. Other variables were also collected including laboratory values, location of the mass, the investigation undertaken, and the stage of the tumor. Results: A total of 61 patients were included, the mean age was 61.2 ± 1.51 years, 25 (41%) were females. The tumors were located in the head (83.6%), body (10.9%), tail (1.8%), and in multiple locations (3.6%) of the pancreas. Half of the patients (50%) had Stage IV, 16.7% stages IIB and III, and only 8.3% were stages IB and IIA. On univariable analysis a lower hemoglobin level predicted resectability odds ratio 0.65 (95% confidence interval, 0.42-0.98), whereas on multivariable regression none of the variables included in the model could predict resectability of pancreatic cancer. A CA 19-9 cutoff level of 166 ng/mL had a sensitivity of 89%, specificity of 75%, positive likelihood ratio of 3.6, and a negative likelihood ratio of 0.15 for resectability of pancreatic adenocarcinoma. 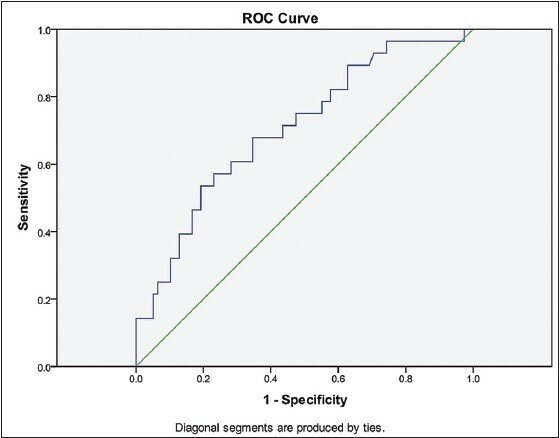 Conclusion: This study describes the clinical characteristics of patients with pancreatic adenocarcinoma in Saudi Arabia. None of the clinical or laboratory variables that were included in our study could independently predict resectability of pancreatic adenocarcinoma. Further studies are warranted to validate these results. Vanishing bile duct syndrome (VBDS) is a condition resulting from severe bile duct injury, progressive destruction, and disappearance of intrahepatic bile ducts (ductopenia) leading to cholestasis, biliary cirrhosis, and liver failure. VBDS can be associated with a variety of disorders, including Hodgkin's lymphoma (HL). We describe a 33-year-old male patient who presented with lymphadenopathy and jaundice, and was diagnosed to have HL. Serum bilirubin worsened progressively despite chemotherapy, with a cholestatic pattern of liver enzymes. Diagnosis of VBDS was established on liver biopsy. Although remission from HL was achieved, the patient died of liver failure. Presence of jaundice in HL patients should raise the possibility of VBDS. This report discusses the difficulties of delivering chemotherapy in patients with liver dysfunction. HL-associated VBDS carries a high mortality but lymphoma remission can be achieved in some patients. Therefore, liver transplantation should be considered early in these patients.